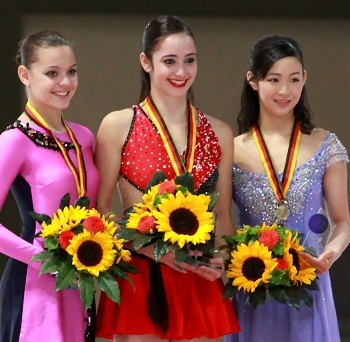 The 44th Nebelhorn Trophy took place September 27-29, 2012, in Obsertdorf, Germany at Eislaufzentrum Oberstdorf. Approximately 100 skaters/teams representing 31 countries competing in the Men, Ladies, Pairs, and Ice Dance disciplines in this annual international senior event. Top favorites Tatiana Volosozhar and Maxim Trankov of Russia were the clear winners in the Pairs event, defending their title with over 17 points to spare. USA’s Caydee Denney and John Coughlin won the silver, while Vanessa James and Morgan Cipres of France took the bronze. Volosozhar and Trankov did not have a perfect outing in their short to a jazz version of The Godfather. The team opened with a high triple twist, but Volosozhar stepped out of the triple Salchow—a new jump for them in short program. She was also a little shaky on the throw triple loop, and the exit of their level-four lift could have been smoother. The death spiral was a level two, while the footwork and the side by side spin were a level four. Nevertheless, the two-time World silver medalists scored 65.24 (34.03/31.21) points for a comfortable lead. “Today I am not pleased with myself,” Volosozhar commented. Denney and Coughlin debuted a new short program to Concierto de Aranjuez after dumping their originally planned Swing medley. The US champions produced a big triple twist, a side by side triple toe, and got a level four for the spin and footwork, but Denney stumbled out of the throw triple Lutz. They collected 57.29 (31.24/26.05) points. James and Cipres turned in a solid program to Rhumba d’Amour and music by Safri Duo that featured a side by side triple toe and a throw triple flip. They went for a triple twist, however, it was a bit messy. The French team picked up 55.00 (29.29/25.71) points. It was also a nice birthday present for James, who turned 25 on Thursday. “I wanted to skate well to make myself a present, but I was very focused,” she said, also revealing that her partner gave her a studio couch for her new apartment. Russia’s Vera Bazarova and Yuri Larionov finished fourth at 52.43 (27.37/26.06) points. Bazarova fell on the triple toe in their Liebestraum program, and two-footed the throw triple loop. The highlight of the program was their huge triple twist. Bazarova has been bothered by an injury to her right hip over the summer, and only recently resumed jumping. The injury flared up again and the team had to withdraw before the free skate. Daria Popova and Bruno Massot of France turned in a solid performance in which the only major error was a two-footed landing by Popova on the throw triple loop. They placed fifth with 47.44 (26.53/20.91) points. Volosozhar and Trankov had a strong competitive debut with their intense free program to Violin Muse. The European champions produced a high triple twist, side by side triple Salchow-double toes, a throw triple loop, triple toes, and two level-three lifts. Volosozhar only two-footed the landing of a throw triple Salchow and the last live merited only a level two. The team had moved the triple toe, both throws, and the lifts into the second half of their program. 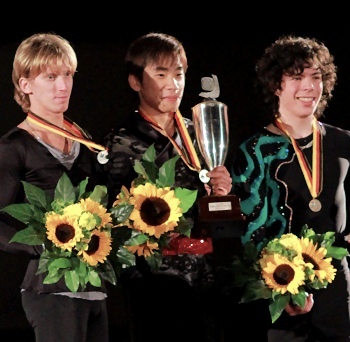 The 2011 Russian champions, which dedicated their free skate to the earthquake and tsunami catastrophe in Japan, placed first in the long with 131.31 (65.13/66.18) points, and overall (196.55). “We skated better than in the short program today,” Volosozhar said. Skating to Phantom of the Opera, Denney and Coughlin hit a triple twist, throw triple loop and Lutz, and displayed spectacular lifts. Only Denney’s triple toe was a little shaky. 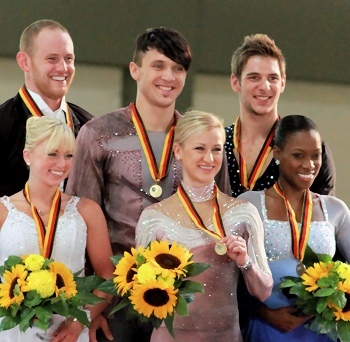 The 2012 Four Continents silver medalists placed second in the long with 121.61 (63.50/58.11) points, and overall (178.90). James and Cipres placed fourth with 96.52 (48.18/48.34) points for their dynamic long program to Pearl Harbor. The team clashed together on the triple twist and James stepped out of the side by side triple Salchow. While the triple toe-double toe sequence was good, both throw jumps were not clean. With a total score of 151.52 points, the French silver medalists was able to maintain third overall for the bronze. “This is our first medal at this competition after one season of competition together,” observed James. “We have two great examples at this competition to look up to and we are looking forward to being as good as them,” James said, referring to the gold and silver medalists. USA’s Gretchen Donlan and Andrew Speroff performed a lyrical Sleeping Beauty program that was highlighted by beautiful lifts, but they had issues with the side by side jumps. They only went for a side by side double toe and later he singled the Axel. They placed third with 102.14 (51.93/50.21) points, and fourth overall (145.35). Germany’s Mari Vartmann and Aaron van Cleave, who stood in seventh after the short, withdrew from the event after the morning practice. Vartmann had picked into her right foot when she fell on the throw triple loop in the short. An x-ray revealed no broken bone, but a contusion. It was a walk in the park for Japan’s Nobunari Oda, who dominated the event and won the gold with over 20 points to spare. Konstantin Menshov of Russia won the silver, while USA’s Keegan Messing took the bronze. Oda celebrated a comeback after a long injury break. Although the Japanese fell on the quad toe, he recovered to land a big triple Axel and triple flip-triple toe. He also picked up a level four for all spins, scoring 79.64 (42.86/37.78) points for his routine to Kamen’s The New Moon in the Old Arm’s Moon. Following the Grand Prix in Paris in November 2011, the former Four Continents champion had to take a break of three months in order to recover from his knee injury. Menshov pulled off a high triple Axel, a quad-double toeloop, but doubled the Lutz in his routine to music from the Pina soundtrack. He finished second with 69.30 (35.91/33.39) points. Messing nailed a big triple Axel in his fast-paced Swing program to Sing, Sing, Sing, but then he tumbled on the triple Lutz-triple toe and also put down his hand on the triple flip. His spins were fast and well-centered, and the American picked up 68.56 (37.42/32.14) points. Indeed he received the one point deduction for a fall. Denis Ten of Kazakhstan put out an exquisite program to music from The Artist soundtrack. He fell on an underrotated quad toe and overrotated the triple Axel before landing a triple flip-double toe. Two spins garnered a level four. Despite the mistakes, the program, choreographed by Lori Nichol, was a true highlight and featured the best transitions and the most complex choreography. He came in fourth with 67.88 (33.59/35.29) points. The components should have been higher for the 19-year-old, who was coached by Stéphane Lambiel in Oberstdorf. “This year’s programs are both to The Artist and the long program is the continuation of the short program,” Ten revealed. Michal Brezina made errors on all jump elements in his program to In the Hall of the Mountain King. The Czech went down on the quad Salchow, singled the Axel, and stumbled on his triple flip-triple toe to finish fifth with 67.78 (32.84/35.94) points. Peter Liebers of Germany and Andrei Rogozine of Canada gave solid performances with triple-triple combos and triple Axels, and finished sixth (67.41) and seventh (67.31), respectively. Oda debuted his new program to music from The Sorcerer’s Apprentice soundtrack. He stepped out of the quad toe, but reeled off two triple Axels and five clean triples, including a triple loop with both hands over his head. The only major glitch came when he singled a flip. The former World Junior champion earned a level four for two spins while the footwork and the change camel spin were a level two. He placed first in the long with 153.69 (75.25/78.44) points, and overall with a total score of 233.33. Skating to Allegro, Rose, and Night Run by René Aubry, Menshov landed the only clean quad of the evening—a toe, but then decided to downgrade his next combination to triple toe-triple toe. The 2011 Russian champion nailed five more triples, including two Axels, but singled a planned double Axel. He placed second in the long with 143.64 (73.26/70.38) points, and overall (212.94). Messing’s dynamic routine to music from The Matrix soundtrack featured a triple Axel, triple Axel-triple toe, and again fast spins, but he stepped out of the quad toe and fell on the exit of his trademark split jump, leaving out the next jump. He placed fourth in the long with 142.22 74.52 68.70 points, but with a total score of 210.78, was able to maintain third place overall. USA’s Stephen Carriere recovered from a faulty short program to moved up to fourth place overall (209.11). The 2007 World Junior champion hit six triples and maintained good speed throughout his program to Swan Lake. He only missed the second triple Axel and put down his hand on the triple flip. The 23-year-old also picked up many points for his excellent spins and footwork, all graded a level four, and placed third in the long with 143.43 (75.93/68.50) points. Brezina kept last year’s long to The Untouchables. He fell three times, again on the quad Salchow, on a triple flip and triple loop, but both triple Axels were strong. The 22-year-old remained in fifth place overall with 201.71 points. Teammate Tomas Verner pulled up from 10th to sixth place overall (199.98). The 26-year-old underrotated and stumbled on his quad attempt. Ten crashed on a downgraded quad toe and made some other errors to slip to seventh overall (198.39). His long program (130.51) did not fall apart, however, and his level four circular step sequence was a true highlight. Kaetlyn Osmond of Canada upset Russia’s Adelina Sotnikova, the favorite to win the event, to win her first senior international competition. Haruka Imai of Japan catapulted from ninth to third place overall to clinch the bronze. Sotnikova fell on the back end of her triple toe-triple toe combination, but nailed a good triple flip and double Axel in her routine short to Capriccio Espagnol by Nikolai Rimski-Korsakov. The beautiful spins were strong as well, with all three garnering a level four, and the one-hand-held Biellmann position in the layback spin was especially beautiful. The World Junior bronze medalist, who displayed a lot of musicality in her routine, scored 58.48 (32.91/26.57) points for a first place finish. Osmond opened her routine with a triple toe-triple toe as well, but stepped out of the landing. She went on to complete a triple flip, double Axel, and two level-four spins to score 55.68 (30.88/24.80) points. The new triple-triples are not yet in the programs, but may come later this season. Performing to Tales and Legends by Rolando Tambin, Elena Glebova hit a triple Lutz and a double Axel, but stumbled out of her triple toe-triple toe. The Estonian skater picked up a level four for the combination spin, but the footwork was a level two, and she earned 54.26 (29.37/24.89) points for a third place finish. Russia’s Polina Shelepen produced a triple Lutz-triple toe and a double Axel in her Latin medley, but the landing on the triple loop was a little tight and the flying sit spin merited only a level two. The 17-year-old came in fourth with 53.63 (29.94/23.69) points. Nathalie Weinzierl of Germany landed a solid triple Lutz-double toe and a triple toe to finish fifth with 49.64 points. Two spins had a level four, but she stepped out of the double Axel. Osmond turned in a technically strong performance to Carmen and managed to interpret this over-used music in an interesting way. The 2012 Canadian national bronze medalist landed a triple flip-double toe, triple Lutz (edge call), double Axel-triple toe, and two more triples. She only fell on an underrotated triple toe towards the end, and scored 114.51 (59.15/56.36) points for a first place finish in the long, and overall (170.19). The “Carmen” program was choreographed by Lance Vipond. “We’ve tried to keep a lot of the classical Carmen and still make it modern and new,” the skater explained. Osmond also revealed that she had watched Katarina Witt, Debi Thomas, and others while trying to get the feel of the program. Sotnikova crashed on her opening triple Lutz, but came back to hit a triple flip, double Axel-triple toe, a triple Salchow, and loop. Although she popped the second flip, the skater proved she has grown as a performer skating to Blues and pieces from Burlesque. However, this was one error too many, in spite of her excellent spins, and she placed second in the long 109.75 (54.36/56.39). With a total score of 168.23 points, the three-time and current Russian champion slipped to second overall. Japan’s Haruka Imai, who stood in ninth after the short, placed third in the long with 105.94 (55.02/50.92) points. She landed four clean triples, but three other jumps were underrotated. Nevertheless, it still was good enough to nab third place overall with 153.64 points. Glebova dropped to fourth (152.36) overall. The 23-year-old completed a triple toe-triple toe, but did a three-turn out of the Lutz and doubled a flip and a loop. Shelepen started well into her Gone with Wind routine with a triple Lutz and loop, but then in the second half ran out of steam. She singled a Salchow and failed to do a proper combination. The two-time and current Russian junior silver medalist placed fifth overall with 147.59 points. Viktoria Helgesson of Sweden finished sixth (145.16), followed by Weinzierl (142.96). USA’s Madison Chock and Evan Bates came from second place to win the title, while Azerbaijan’s Julia Zlobina and Alexei Sitnikov moved up from third to take the silver. Nelli Zhiganshina and Alexander Gazsi of Germany, who stood in first after the short dance, slipped to third for the bronze. Zhiganshina and Gazsi shone in their cute program to Polka by Alfred Schnittke and a Waltz from the Russian movie Admiral. The German champions picked up a level four for the twizzles, the first Yankee Polka sequence, and the curve lift, while the side by side circular footwork was a level three and the second Polka pattern a level two. They scored 59.58 (31.08/28.50) points for first place. Chock and Bates had chosen music from Cirque du Soleil for their Polka and Waltz. The Americans were smooth, but only there rotational lift got a level four. The two Polka sequences garnered a level two. The students of Igor Shpilband collected 56.97 (28.79/28.18) points for a second place finish. Zlobina and Sitnikov produced an entertaining program to a Waltz and a Finnish Polka that included level-four twizzles and a level-four rotational lift. The team was awarded 56.95 (29.93/27.02) points for a close third place. Ksenia Monko and Kirill Khaliavin of Russia placed fourth with 54.92 (27.56/28.36) points. Monko wobbled on a twizzle in the side by side footwork that was a level two. They had picked a French Waltz to Sous le ciel de Paris and interpreted it well, but the Polka appeared just tacked on to it and didn’t really go with the Waltz. Canada’s Alexandra Paul and Mitchell Islam were fifth (54.50), followed by Siobhan Heekin-Canedy and Dmitri Dun of the Ukraine (54.44). Zlobina and Sitnikov showed a fast-paced and upbeat dance to the folkloric pieces Mahalageasca and Ausencia by Goran Bregovic. They, too, maintained high speed and produced difficult elements. A straight line lift was a level two, but the twizzles, spin, and two rotational lifts were a level four. The Russian-born skaters scored 86.64 (44.24/42.40) points for their free dance, and moved up second overall with 143.59 points. “We skated well for ourselves today, but we will continue to work hard in order to improve further and to reach higher goals,” Sitnikov commented. He went on to explain that they decided to represent Azerbaijan in order to have an opportunity to compete at major international events. Zhiganshina and Gazsi no doubt had the flashiest costumes of all teams, portraying zombies rising from the grave for a dance on the cemetery. While the program was very entertaining and fun to watch, it was a little shaky and slow in some places. This cost the German champions important points for components and grade of executions, although their levels were okay. The team collected a level four for all three lifts and the spin, but the circular footwork merited only a level two. The Germans placed fifth in the free dance with 82.42 (41.5/ 41.91) points for the free dance, and slipped to third overall with 142.00 points. Monko and Khaliavin produced a Flamenco-themed dance. Apart from another wobble by Monko on the twizzles, the dance was solid and had good flow. The 2011 World Junior champions were ranked third in the free dance with 84.78 (42.16/43.62) points, but remained in fourth place overall with a total score of 139.70 points. Paul and Islam danced to music from the romantic movie The Legend of 1900 and seem to be back on track after a difficult season. The performance was strong and they finished fourth in the free dance 83.42 (41.62/41.80) and fifth overall (137.92).